As longtime readers know, I've been a big STAR WARS fan since I was a kid in 1977. Despite that, I'll say at the outset that I was extremely dubious about seeing the prequel SOLO: A STAR WARS STORY (2018), to the point where I didn't catch it until it had been out for 10 days. Of the newer STAR WARS films, I liked THE FORCE AWAKENS (2015) and ROGUE ONE (2016), but I've felt more negative about what I saw in THE LAST JEDI (2017) as I've contemplated it in the months since. That left me, and (based on the disappointing box office) apparently a lot of other viewers uncertain about seeing SOLO. Among other issues: SOLO without Harrison Ford? 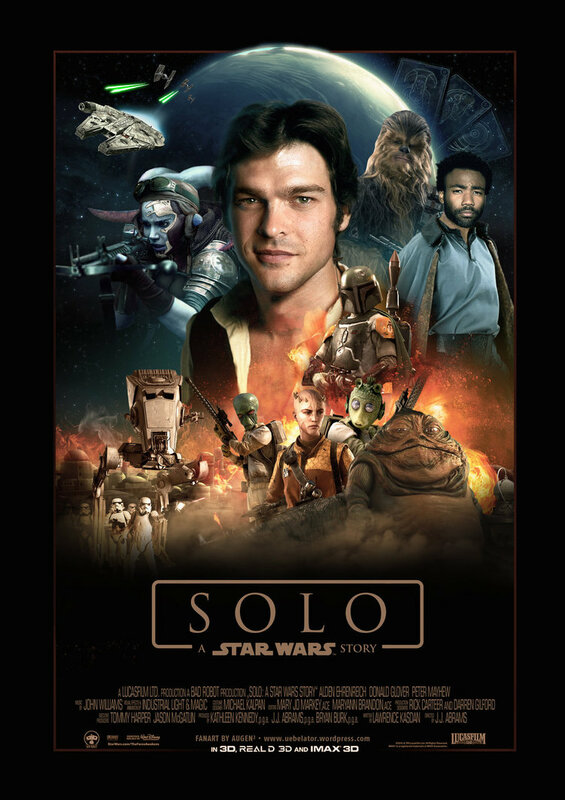 After hearing positive reports on SOLO from family, friends, and the esteemed Leonard Maltin, I decided I needed to see it, if only to evaluate it for myself. I figured if I went in with low expectations I was likely to enjoy it to some degree. And meanwhile, there's always popcorn! 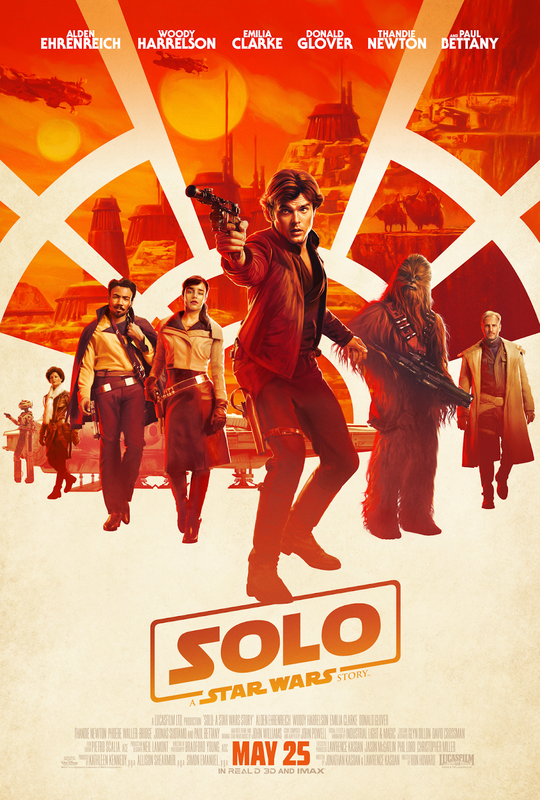 SOLO features an excellent cast in quite a good story which doesn't try to do too much or have extraneous plotting (ahem, LAST JEDI), and more than any other of the recent films, it looks, feels, and sounds like STAR WARS, including good use of John Williams' themes. As I watched it, I actually thought to myself that I couldn't believe I was, in a sense, watching "more" original STAR WARS...it felt more like '77 for me than any of the other recent movies. (ROGUE ONE came closest before SOLO.) It was a little bit like being able to time travel, both in terms of the story and the film's overall style, and I couldn't have been happier. The movie's only weak spots, in my estimate, were a too obviously Dickensian setting for the opening sequence, and a 2-hour-and-15-minute run time which should have been tightened up by several minutes. As the movie begins, orphan Han (Alden Ehrenreich) and his friend Qi'ra (Emilia Clarke) are attempting to escape Corellia, the planet where they've basically been forced to work as Artful Dodgers for a monstrous Fagin (Linda Hunt). The pair are separated in the escape attempt, and Han heads off to train as a pilot, but he and Qi'ra will meet again. Han reconnects with Qi'ra, meets Lando Calrissian (Donald Glover) and flies on the Millenium Falcon for the first time, and generally has quite a series of adventures. Seeing the depiction of things mentioned in the original film, such as Han winning the Falcon from Lando or the Kessel Run ("in less than 12 parsecs!") is all kinds of fun. I wasn't sure what I would think of Ehrenreich as Han but as the film went on I was quite satisfied; he hits the right notes to show Han as both cocky and good-hearted. He manages to do the sideways grin without seeming arrogant; he is, as one character describes him, essentially "a good guy." 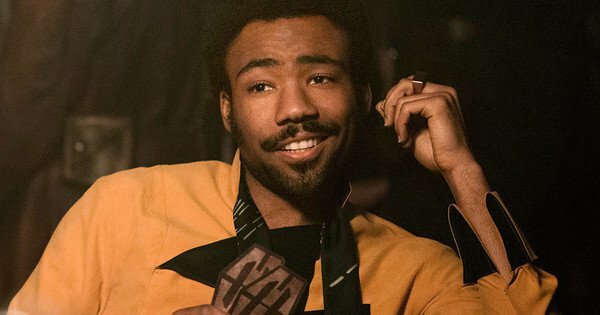 Likewise, Glover is note-perfect as the so-cool Lando. Clarke's Qi'ra is the big question mark character of the film -- is she loyal to Han or to Vos? -- and reflecting back on the film I saw how well the filmmakers had laid out hints about her character. Who else would be so taken with exploring Lando's cape collection while in the midst of a life and death mission? Clarke keeps her mysterious character interesting while we wait to learn if she's heroine or femme fatale. 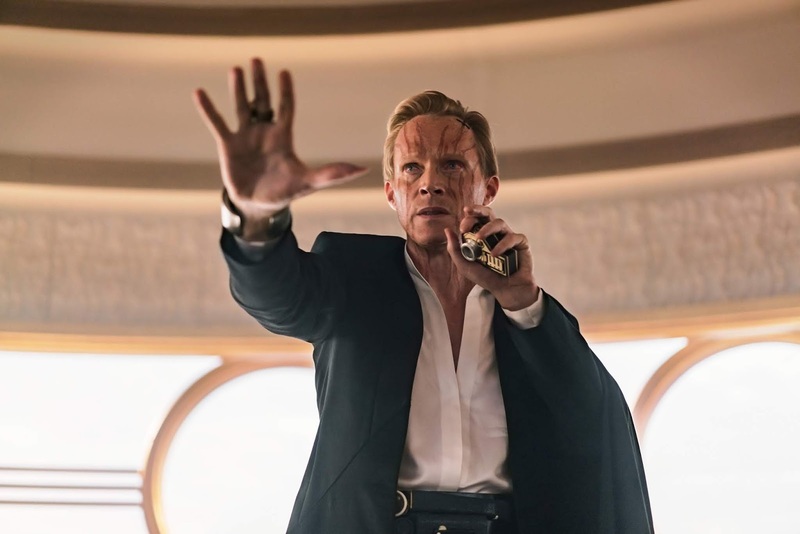 Bettany is appropriately scary as the gangster Vos, although I found it just a tad confusing that Bettany was plucked straight out of the Marvel Cinematic Universe, discolored face and all. (I might have laughed when I saw the colored streaks on his face.) I think it would have been good to go with another actor just to keep each of the series in their own lanes, so to speak. Solo also uses Marvel's Jon Favreau (Happy Hogan), but since he's just providing a voice, for Beckett's pilot Rio, it's not as distracting. The set designs, creating a Star Wars world, are just right, a solid mix of real, practical locations and special effects which manage to avoid feeling overly "CGI." The twisting, turning train set piece is particularly outstanding; the train is simultaneously both something we haven't seen before and familiar in terms of its shape and color design, like something we would expect to see in the STAR WARS universe. I especially liked the moments which these days some derisively call "fan service" but I call "respect" and "authenticity." For instance, the helmet worn by Beckett in SOLO is the same one Lando wears in the rescue sequence which opens RETURN OF THE JEDI (1983), and look for Warwick Davis, the actor who played Wicket the Ewok in JEDI, out of costume as a new character in this one. The smuggling compartments on the Falcon, a hologram chess game with Chewie...there's a lot of good, familiar stuff here which will make fans of the original trilogy feel right at home. 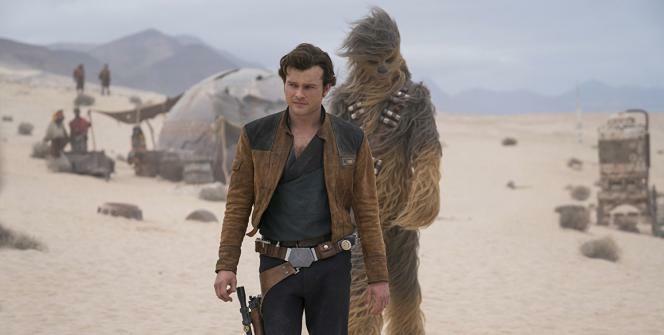 I'd add that whereas the original STAR WARS (A NEW HOPE) felt a bit like a swashbuckler in outer space, SOLO has a distinctive "Western in space" feel I liked a lot, with a bit of gangster movie on the side. As has been well-chronicled, Ron Howard took over directing the film partway through, including extensive reshoots. Whatever he did, it worked. (I wonder, though, if news about the film's rocky production history is part of the reason for the poor box office, along with the lingering aftereffects of fans unhappy at Luke's storyline in THE LAST JEDI?) Incidentally, watch for Ron's brother Clint, who turns up in a scene! The film was written by Lawrence and Jonathan Kasdan; Lawrence Kasdan is a Lucasfilm writer from way back and gets it all right. My husband said "They didn't mess it up," which is a great compliment coming from him! The cinematography was by Bradford Young; the (unmemorable) non-Williams parts of the score were composed by John Powell. Parental Advisory: SOLO: A STAR WARS STORY is rated PG-13. There is some cussing and the usual level of STAR WARS violence, with several characters dying, while others act heroically. Any interest I might have had in the movie was ruined by the trailers because the actor playing Han is so flat in all of them! What were they thinking. Hi Missy! I wasn't very impressed by the movie's trailers; they definitely weren't the impetus for me to see the film. 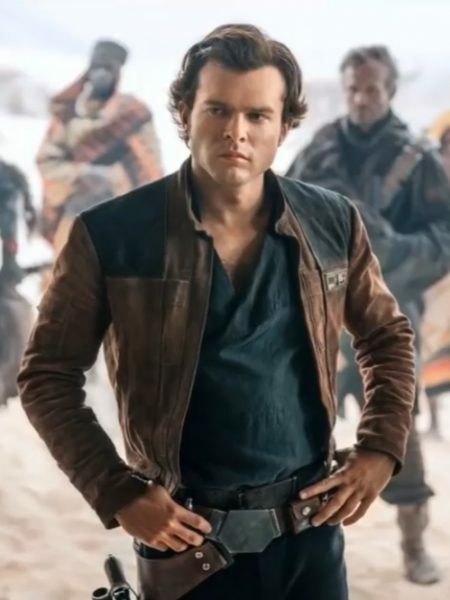 Like everything else about the movie, I found the actor better than I expected and enjoyed him as Han. If you see it sometime I'd be curious what you think.